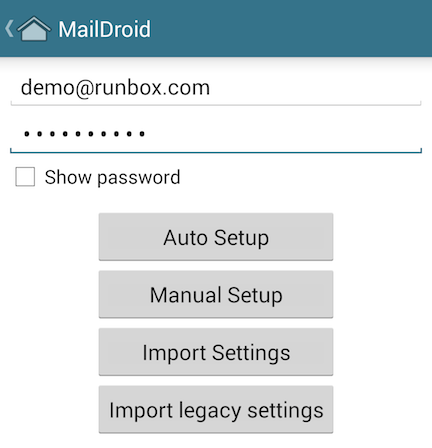 To set up MailDroid with Runbox, please follow the step-by-step instructions below. Note that the setup process and dialog boxes on your computer may vary slightly from what is shown here, depending on what version of MailDroid you are using (these screen shots were made with MailDroid 3.53). When you open MailDroid for the first time you will be asked to set up a new account. If you already have accounts set up you will need to go to Manage Accounts and then tap on the + in the top right to add a new account. You will be shown the screen below. Enter your email address and password, then tap on Manual Setup. You now need to select the account type. 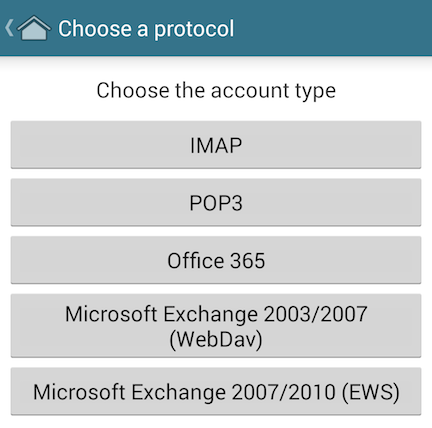 We recommend using IMAP as this allows your email clients to synchronise across all your devices and the webmail. Next enter the incoming and outgoing server details on the next screen. Be careful to enter them accurately and to enter your username in the correct format. When you are done tap Next. In order to store Drafts, Sent, and Trash messages on the server, you will need to select the server side folders. 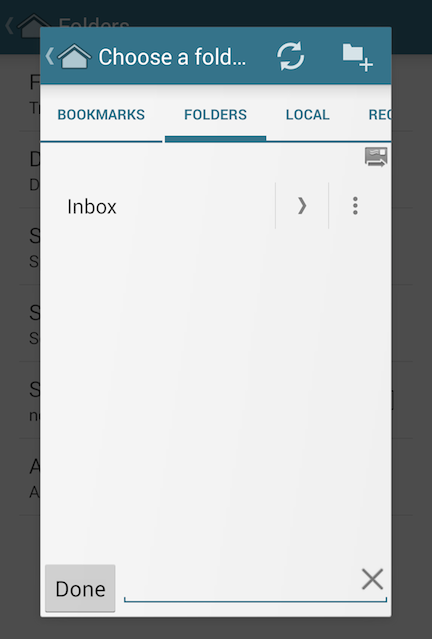 You can do this when you are in your Runbox account in MailDroid by tapping on the menu icon in the top right and then choosing Settings. Here you will find an option called Folders. Tap on this and you will be shown the screen below. To set up your device so it looks like the screen above tap on menu item in turn. For each of the folders you will be shown the screen below. If you select the arrow to the right of Inbox you will be shown a list of folders in your account. Select the folder corresponding to the folder you are trying to set up in each case. 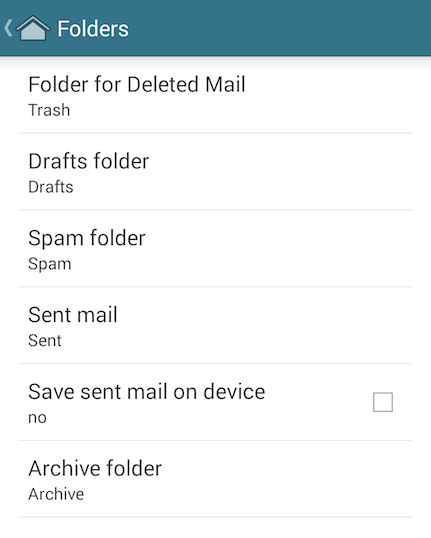 Once you have done this you have completed set up Runbox in MailDroid.